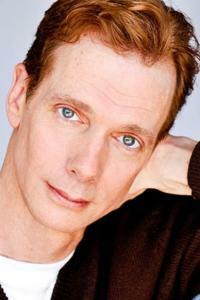 Doug Jones is an American actor, singer, writer and former contortionist born on May 24, 1960 in Indianapolis, Indiana, USA. He went to Bishop Chatard High School and graduated from Ball State University in 1982 with a Bachelor's degree in Telecommunications and a minor in Theatre. He is 6' 3½" (1.92 m), and his nickname is Dougie. He is the youngest of four brothers and moved to Los Angeles in 1985. He has acted in over 131 movies. His performance as 'Abe Sapien' in Hellboy (2004) has made him famous. He married his wife Laurie Jones in 1984, and they currently live in California. They do not have children of their own and play a parental figure in soon to be struggling young actors' lives. They mentor young people who are interested in working the film industry and are starting their careers in the business. Doug and his wife try to visit home in Indiana whenever they can. Doug started his acting in 1987 “The Newlydeads” playing the role of Tim. He is best known for his roles in science fiction, fantasy, and horror movies playing the roles of non-human characters with heavy prosthetic makeup on. Some of those films include Pan's Labyrinth, Hellboy and its sequel Hellboy II: The Golden Army, Hocus Pocus (zombie Billy Butcherson), Falling Skies, Fantastic Four: Rise of the Silver Surfer and Buffy the Vampire Slayer. He said "I have to make that a part of my being and my physicality and again, acting is a full body experience and that's a part of it when you're doing a costumed character" regarding working with prosthetic makeup. Mexican director Guillermo del Toro gave Doug the part of the Faun in his Spanish language fantasy horror project El Laberinto del Fauno (Pan's Labyrinth). Doug also played 'The Pale Man' who is a grotesque creature that eats children. His role in Guillermo's movie was not easy as Doug had to learn dialogues in Spanish although his voice was re-dubbed. Doug worked as a contortionist and is nearing over 100 commercials so far. He said "You’d be surprised how many times that comes into play in commercials. They’ll want somebody to hold a box of Tide funny or something. I once squished into a box for a commercial for relaxed fit jeans". He does not have much spare time but when he does, he likes to rollerblade at Venice Beach. He considers himself to be a decent barber because he cuts his own hair and cuts some of his cast and crew hair while they are on location. Doug enjoys singing and sings with his church choir. He believes in God and is a member of Media Fellowship International, which is a Christian group working in the entertainment industry.